To Italy and Back Day 1. It seems we have only just completed our road trip to Spain and here we are heading across the Channel again. This time for a very special reason – Laura and Liam’s wedding next Saturday in San Gimignano in Tuscany. This is us queuing up to board the Eurostar. What company! A Porsche, a classic Sunbeam and two Lambos. In fact we joined a convoy of Lamborghinis on the M20 all heading for the Eurotunnel. We spoke to one of the owners at the terminal who said it was their annual jaunt to France and there were thirty of them going. On the train we found ourselves behind the Sunbeam and the guy told us it was a 1960 model which he had restored himself. The boot was full of tools, spares and petrol. Doesn’t the gauge work? I wondered whether he’d chosen his girlfriend because she traveled light or whether he wooed her in a C Class Merc and then sprung the Sunbeam on her. Anyway, while under the English Channel he pumped up all four tyres with a foot pump. Wouldn’t the pressures have been all wrong down there? On the way down the A26 in France we stopped for coffee in a motorway services and met a woman in an MX5. Her boot was full of luggage – over full really – and she was rummaging through it looking for something for her passenger who was a white Highland Terrier. The two of them were heading to the south of France. The dog had her own seatbelt and liked travelling. I wonder whether she chose that mutt for her like of road trips or whether she just struck lucky. We had a dog who puked within ten minutes of the house. 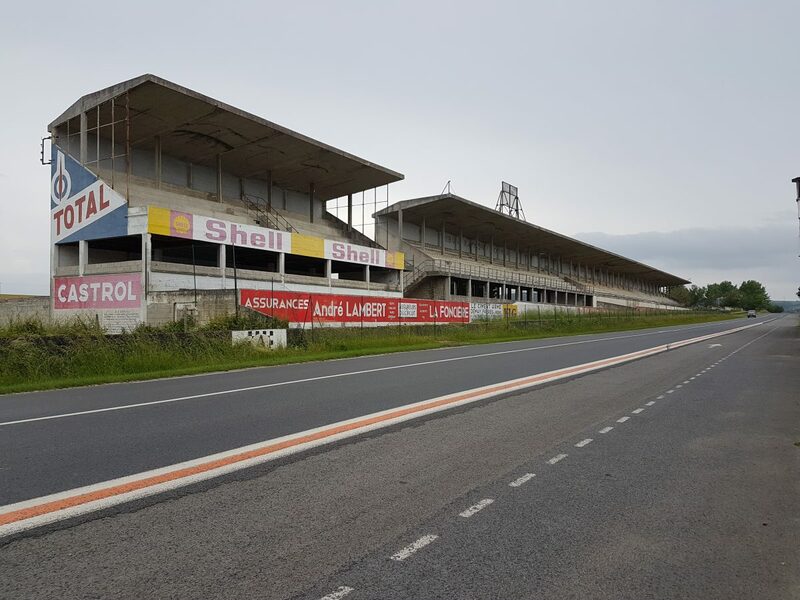 We took a slight detour on the way south to see what was left of the old Reims Grand Prix Circuit. We found the grandstand and the pits and a nice restaurant called Bistro de la Circuit. There were some Brits at the restaurant who were on a ‘Champagne Tour’ whatever that is. One couple had a Jaguar XJS, another an immaculate frog eye Sprite with torneau cover. They said another couple had a Mustang. We’d seen them behind the pits ten minutes earlier but I guess they weren’t hungry or good at navigating. Much of the infrastructure is faded and crumbling but the ‘Friends of Reims’ are trying to restore it, which explains why some bits are brightly painted. Further down the road we stopped for petrol and went in for a coffee. When we came out we found a new Morgan next to us. The driver, an old guy about my age, French, was helping his wife into the passenger seat. She obviously had a bad back, whether caused by the vintage style seats or lifting sacks of peat I’m not sure. Anyway, they had a solution. He pushed a Union Jack cushion down behind her back and buckled her in. I smiled at them and they smiled back but as I got in to our Japanese Toyota I just couldn’t think of anything to say to them. Rule Britannia. Tonight we’re staying in the Hotel de Paris in Dijon, which isn’t as grand as it sounds but is in the centre, has free wifi and a private car park in a cave underneath. We booked it on Booking.com from the car as we got close to the city and it all worked out perfectly. Had a good meal outside in the Place de la Liberation in the old town and I am now sitting outside another bar writing this on my phone (which is asking for trouble I know). It’s warm and gone nine. Nice. Tomorrow we’ll be further south but will it still be as warm as we get nearer the Alps?